I'm generally a creature of habit when it comes to beauty products, and usually stick to my favorite, tried-and-true brands. However, once in a while, I like to try something new to add a little intrigue to my beauty routine. 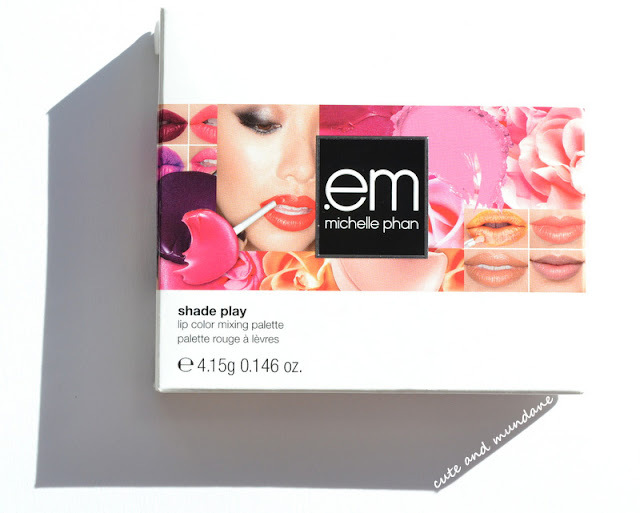 Most recently, it's been my Em by Michelle Phan Shade Play - Lip Color Mixing Palette in 'Mix It Up Plums'. The palette was a Christmas gift from a dear friend who works for one of the big beauty conglomerates. Em by Michelle Phan is the namesake line of one of the biggest names in the YouTube beauty world. (Even my mom's seen her videos). I believe Michelle has collaborated with Lancôme in the past, and now, with parent company L'Oreal, launched here own makeup line (so far only available on the internet). Starting from the packaging (below), one can already see the internet-inspired look. 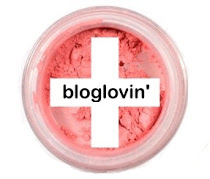 There's a blogger-like collage of lip-swatches, face shots, and magazine-style product smears. On one hand, I appreciate the homage to the DIY blogger / vlogger, however part of me would have enjoyed a sleeker, more professional look to the box. (The white and pink theme, though, I do like). The cover collage seems very blog / vlog inspired. I'm also a fan of the modern white-encased-in-clear plastic packaging of the palette within. (Doesn't the paper white remind you of beauty blog backgrounds?). The cute cursive script on the clear cover tickles my fancy as well. However, on purely personal preference, I would have loved a white logo, which would blend in nicely with the other delicate details! Love the cute cursive writing! Inside my Em by Michelle Phan 'Mix It Up Plums' lip palette, there's a nice mirror, and of course six colors within (three glosses and three lip colors). All have a light vanilla scent. The lip glosses are the smallest circles, while the lip colors are more generously proportioned, which I appreciate. The palette comes with a little brush for on-the-go application. Plus, there's one empty palette slot for mixing a custom color. It's a nice artsy touch! The three small circles are glosses, while the three lip colors are larger in size. 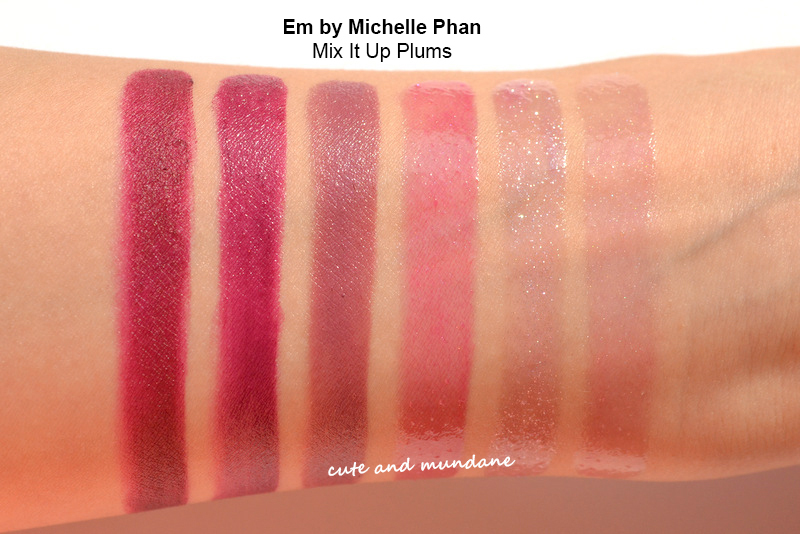 I've swatched all six colors below so you can get an idea of what to expect from Em by Michelle Phan 'Mix It Up Plums'. There are three lip shades: a dark crimson, a dark plummy red, and a neutral pink. There are three gloss shades: medium mauve pink, a clear pale lavender sparkle, and a clear pink sparkle. I was surprised at how wearable the set is; it treads more on the mauve pink (as opposed to purple) side of plum. 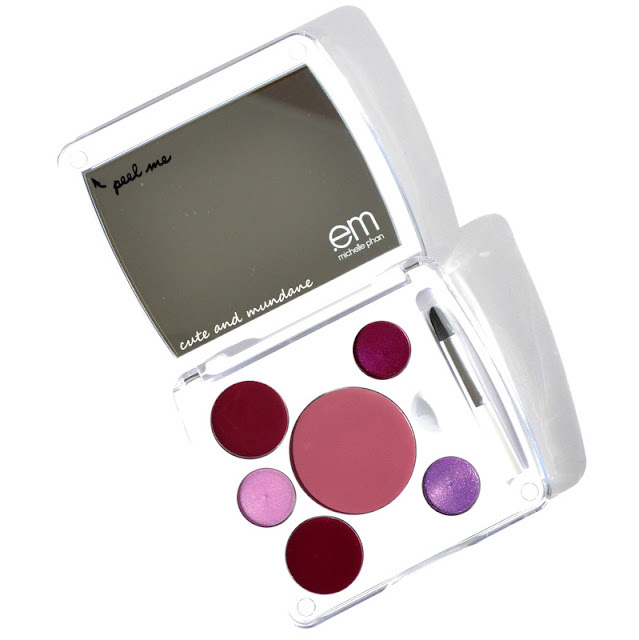 Overall, I'm enjoying my Em by Michelle Phan 'Mix It Up Plums' lip color palette. 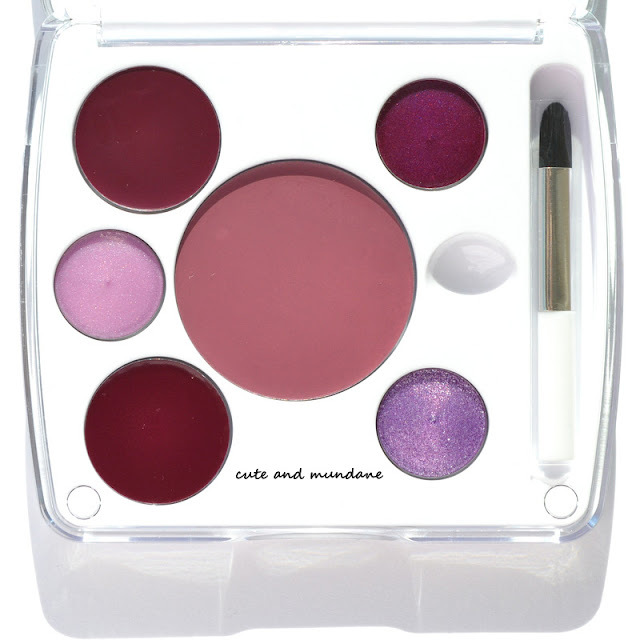 Though plum is not a color I typically wear, I found the shades to be very approachable (not too plummy) and very much to my liking; plus, it's nice to have the option of mixing custom shades that my collection lacks. 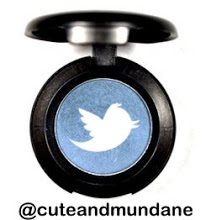 I think beauties looking to build up a lip collection, or those who enjoy custom blending will enjoy the set. I admit, I'm a bit intrigued myself and wouldn't mind trying other lip palettes from the line! Thanks for reading! 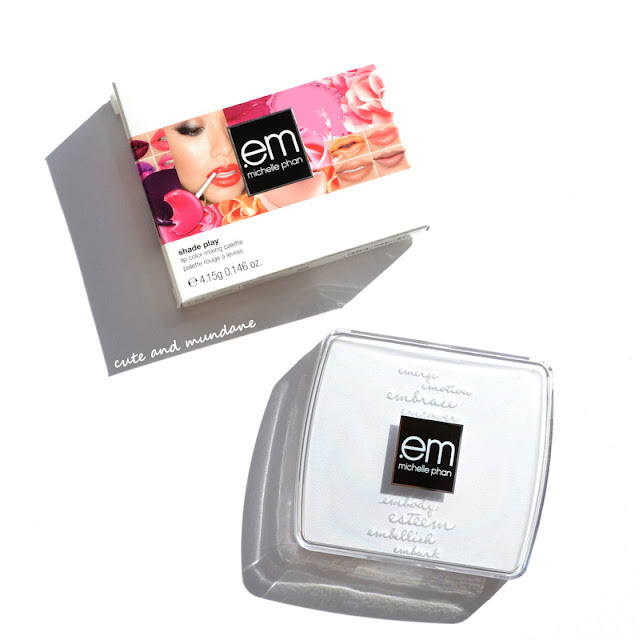 Have you tried any Em by Michelle Phan products? Do you enjoy blending your lip colors? What are your favorite plum lippies? Every year I look forward to collecting LUSH's charming Christmas tins. 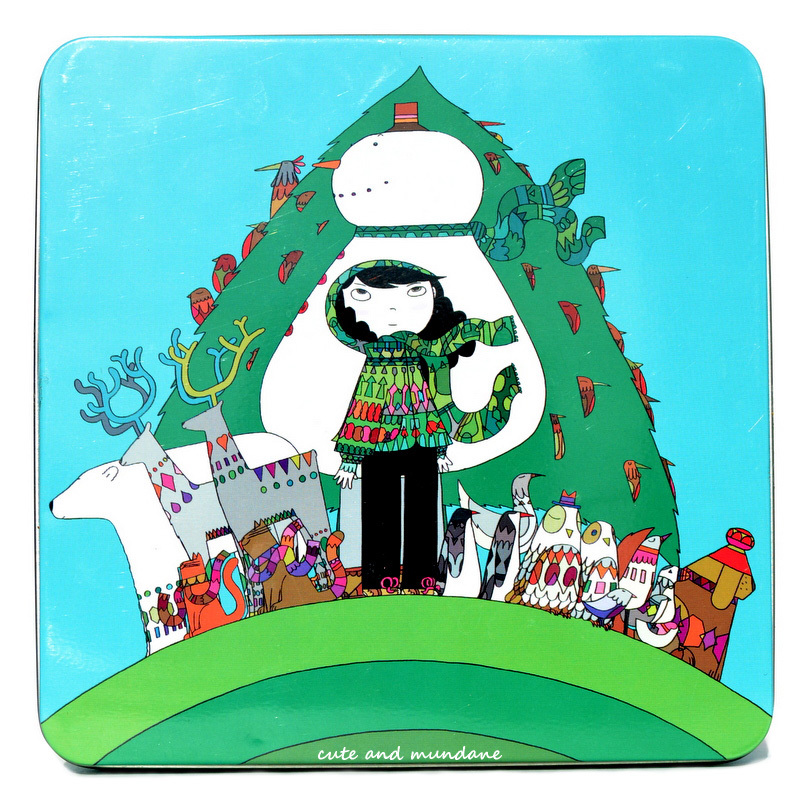 As you can imagine, I was tickled to receive the LUSH Christmas Friends Tin this holiday, courtesy of LUSH Cosmetics! 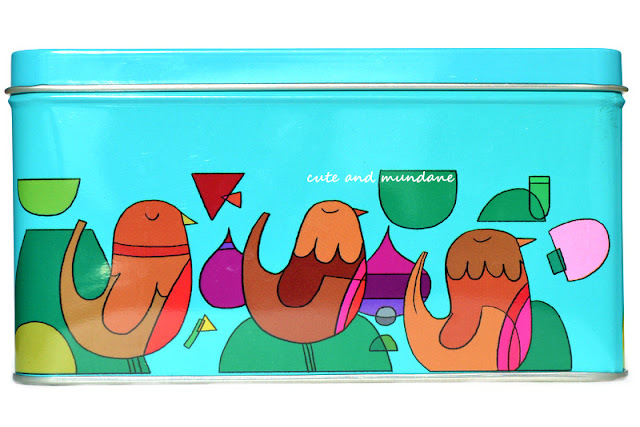 The tin has a beautiful design drawn up by artist Celyn Brezier; as an animal lover, I'm delighted by the whimsical wildlife cover! Inside the LUSH Christmas Friends Tin, you'll find : Bombardino Bath Bomb, The Christmas Penguin Bubble Bar, Snowman Bath Bomb, Father Christmas Bath Bomb, Magic Wand Reusable Bubble Bar, and Melting Snowman Luxury Bath Melt. Also of note: this year's tin is a different size (smaller) than in previous years. The tin confirms the old adage however, that good things really do come in small packages! LUSH Bombardino Bath Bomb is a delectable lemon and cheesecake fizzler. The inspiration behind Bombardino was a hot aprés-ski drink in the Italian Alps (can you imagine?). LUSH The Christmas Penguin Bubble Bar, on the other hand, exudes optimistic orange flower and bergamot bubbles. (For those familiar with LUSH Olive Branch Shower gel, Christmas Penguin shares the same scent). Incidentally, these too-cute mini penguins were inspired by the smallest penguins in the world, the aptly named "Little Penguins" or "Fairy Penguins" of southern Australia! LUSH Melting Snowman Luxury Bath Melt is one spicy snowman. This wonderfully contradictory melt has refreshing sweet orange and lime alongside hot cinnamon and clove. LUSH Father Christmas Bath Bomb scents your soak with a cheery citrus. For a fun twist, this jolly round bomb bubbles red, then green, and finally white! 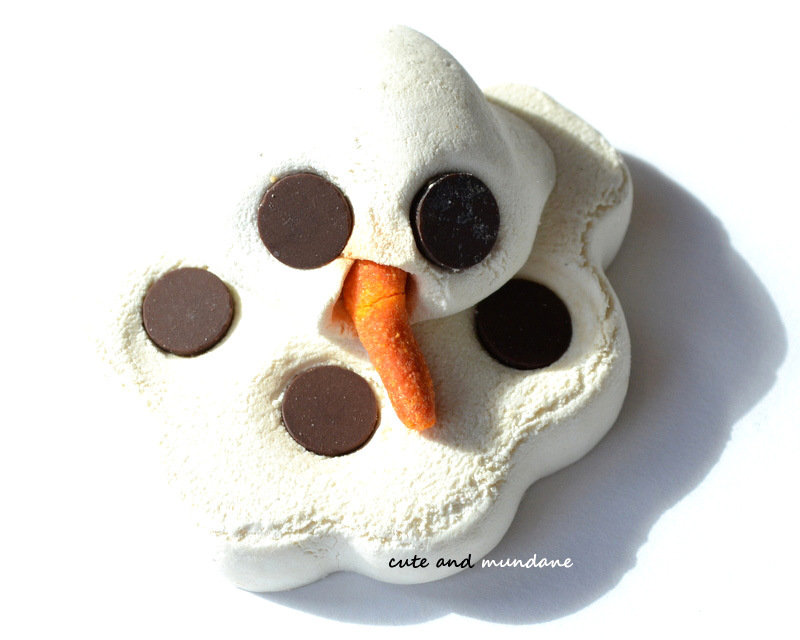 LUSH Snowman Bath Bomb is a creamy concoction containing cocoa butter, scented with ylang ylang and vanilla. The formula is the same as LUSH Butter Ball, packaged into festive holiday form. 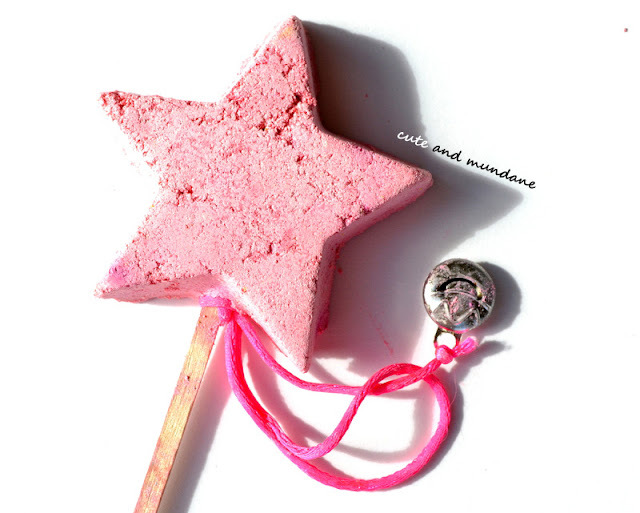 Magic Wand Reusable Bubble Bar is perfect for fans of Snow Fairy (LUSH's sugary shower gel). This cotton candy wand bubbles into a sweet pink cotton candy scented bath. I'm delighted to have LUSH Christmas Friends ($48.95) under my tree this holiday season! If anything, it's hard to decide which fragrant fizzler to enjoy first! I'm thinking it'll either be the lemon cheesecake of LUSH Bombardino or the optimistic orange of LUSH Christmas penguin. As for the adorable tin, I'm keen to re-purpose it to store my other LUSH goodies, or perhaps holiday ornaments! Thanks for reading! What LUSH Holiday goodies have you treated yourself (or others) to this year? 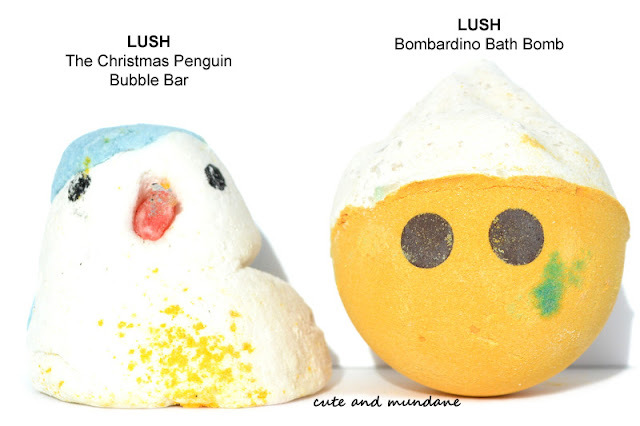 Which of the bath goodies from LUSH Christmas Friends are you most looking forward to trying? It's no secret that I'm sweet on Prada perfumes. I've waxed poetic on quite a few here on Cute and Mundane; their simple elegant ethos never fails to delight! You can imagine how delighted I was to receive a beautiful Prada Candy L'Eau gift set ($92), complete with 2.7 oz. Eau de Toilette, 2.5 oz. body lotion, and pink clutch, courtesy of Prada Parfums. 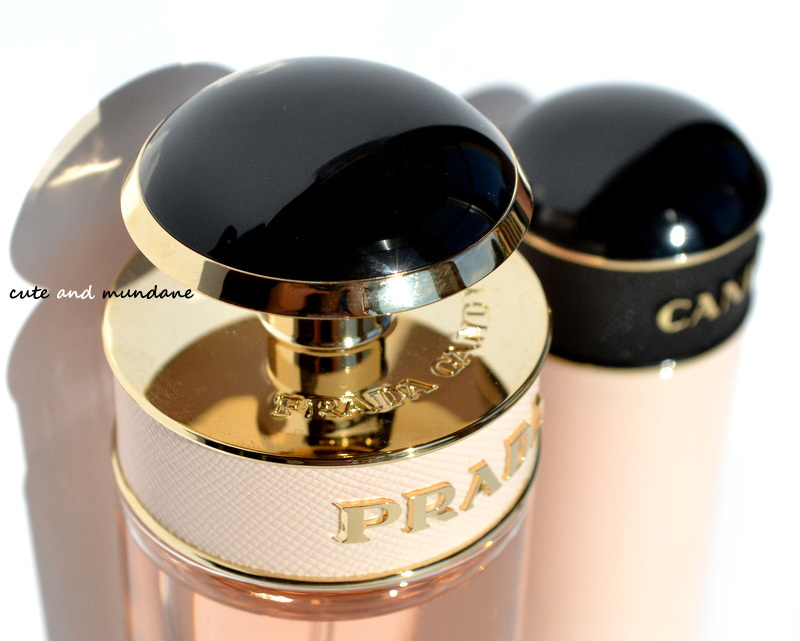 Prada Candy L'Eau Eau de Toilette is a brand new variation on the classic caramel of Prada Candy (reviewed here). The original Prada Candy is a fantastic gourmand, with drips of decadent caramel and the zingy wood of benzoin, combining to create an unusual liqueur-like sweetness tucked away at the center. As the beautiful blush pink packaging suggests, Prada Candy L'Eau is a softer, more wearable variation of the original Candy, bolstered by sparkling citrus and sweet florals. Prada Candy L'Eau exudes the sparkling warmth of sweet caramel alongside hints of citrus and flowers. 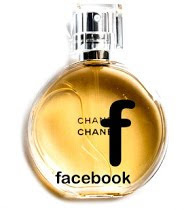 The perfume opens with the tempered zest of a nondescript citrus. It's not a burst and fade; a sliver of citrus adds a soft zest throughout. In a few moments, I encounter caramel, the main undercurrent throughout the entire scent; a light touch of benzoin sends its smoky wooden tendrils through the sugary base. (The effect is reminiscent of the caramelized shell of a fire-roasted marshmallow). Within this delicious, amorphous concoction, sweet pea adds a mid-range velvety floral feel. Initially I was skeptical to see how this floral would perform in the perfume, but found that sweet pea's dewy sweetness (that I'm quite fond of) meshes well with the sugary caramel base. (Brilliant!) Over time, the caramel warms, as if softening on my skin - and a very noticeable musk smooths out the base. Now, to the important question : how does Prada Candy L'Eau compare with the original Prada Candy? After giving it some thought, I'd have to say they're quite analogous in construction. Prada Candy cuts to the chase with a warmer caramel and more complex threads of benzoin; the result is a richer, more caramelized feel, complete with liqueur-like sweetness tucked at the center. 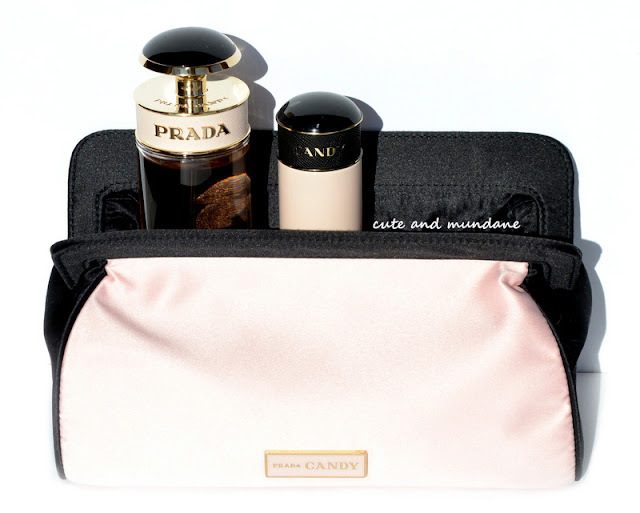 Prada Candy L'Eau shares the caramel and benzoin infrastructure. However these pure elements are tempered, relying on slivers of citrus to replace the acridity of benzoin, and sweet pea to add a low-cal sweetness in the stead of more caramel. The feel of Prada Candy L'Eau is similar to Prada Candy, just a bit more airy. Thanks for reading! 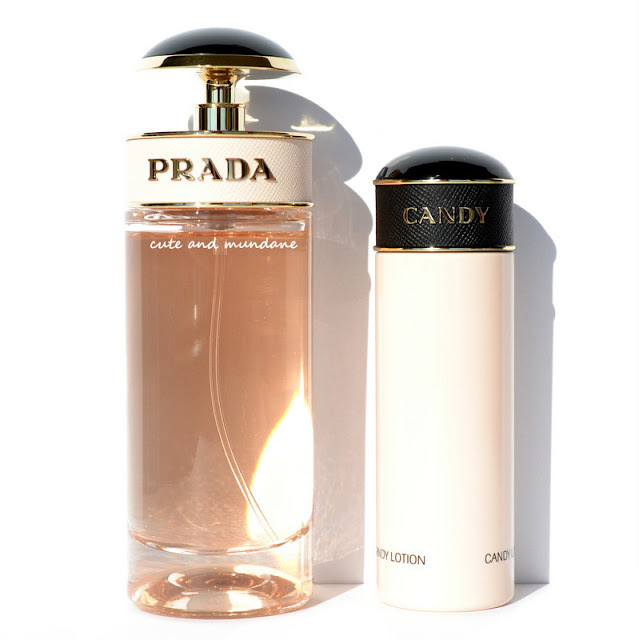 Have you tried Prada Candy or Candy L'Eau? What are your favorite Prada Parfums? What wintry gourmands have you been wearing this season? P.S. If you love Prada perfumes like me, check out my reviews of Prada Infusion d' Iris (my personal favorite), Luna Rossa, and L'Eau Ambrée. 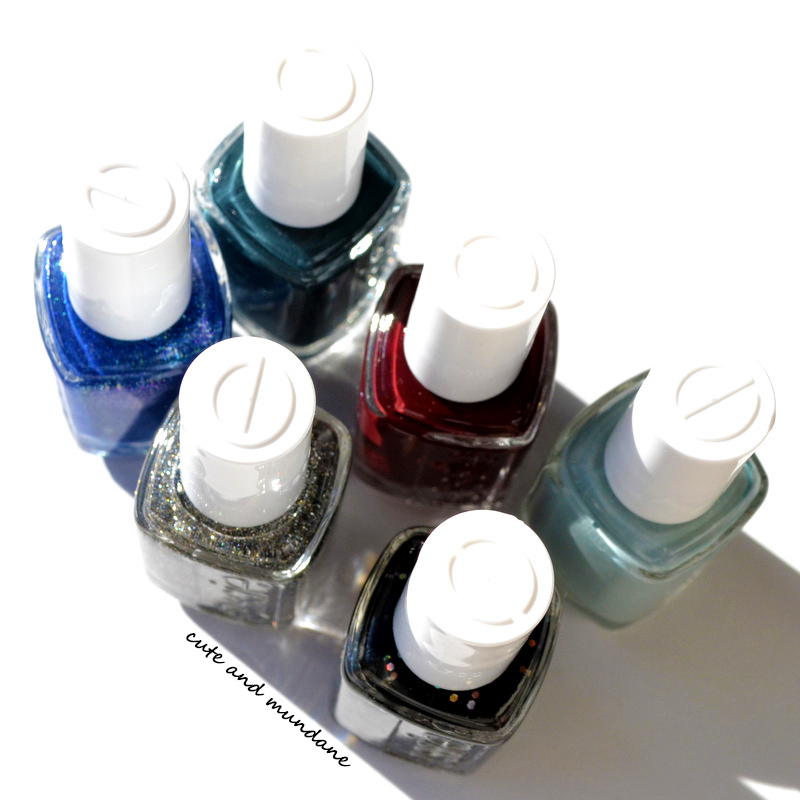 Recently, a few delightful bottles from the Essie Encrusted Treasures collection (Holiday 2013) made it into my stocking, courtesy of Essie! These sparkly shades mirror the glitter of silvery tinsel on holiday wreaths and trees, including a coal-black reminder to always stay on the right side of the naughty-nice spectrum! You'll notice from my review and swatches below that like tree trimmings, this collection is all about texture, texture, texture! 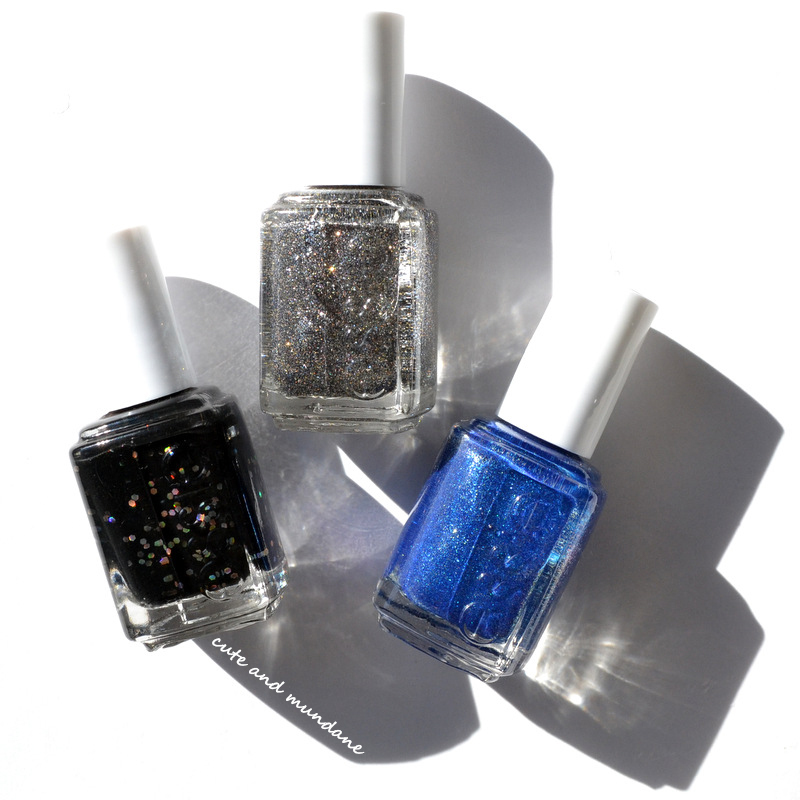 The three shimmering shades I have from Essie Encrusted Treasures include : Belugaria, Ignite the Night, and Lots of Lux. Essie Belugaria, a North Pole coal, encrusted with iridescent flakes. Essie Belugaria walks a fine line between bizarre and beautiful. The jet black caviar and chunky glitter-infused polish imparts an unapologetically three-dimensional texture to my tips. I quite like the effect, and I think it's flattering on my shorter, rounded nails. (Plus, you know I've been all about black polish lately). Essie Belugaria applies relatively smoothly despite the chunky texture; two thick coats does the trick. It's like painting on a chunk of North Pole coal, encrusted with ice crystals. Essie Ignite the Night set my heart aglow with its miniature golden sparkles. Essie Ignite the Night is a glowing grey glitter that certainly sparked my fancy. There's more to this charming charcoal polish than meets the eye! At first glance, you'll see dense charcoal glitter. However, closer up, you'll see miniature micro-sparkles of gold, adding warmth and dimension to the silvery-grey backdrop. 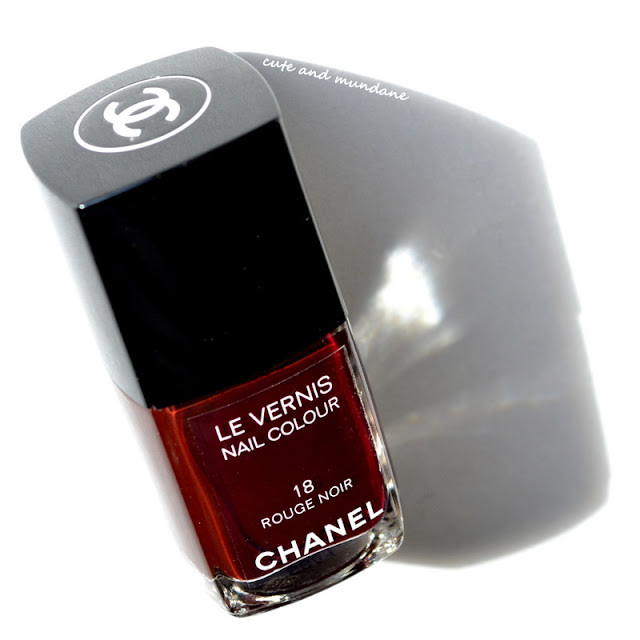 The effect is similar to that of the iconic CHANEL Vernis in Graphite (more on that below). The glitter is quite dense, so 2-3 coats are sufficient. Essie Lots of Lux is a medium blue glitter with a matte effect. The glitter is quite dense, and the polish dries down leaving more of a textured finish than a standard glossy finish. You'll see that Essie snuck in the same golden micro-glitter in here as well, adding a nice touch of warmth. Essie Lots of Lux is matte, but certainly not flat! As usual, I've pulled a few polishes from my collection to better display the nuances in each polish. Essie Belugaria has an oh-so-unique texture that really shines up close. The closest decorated black I have is Sally Hansen Midnight in NY, which has really pretty iridescent sparkles; you can see it's much more subdued than the former! 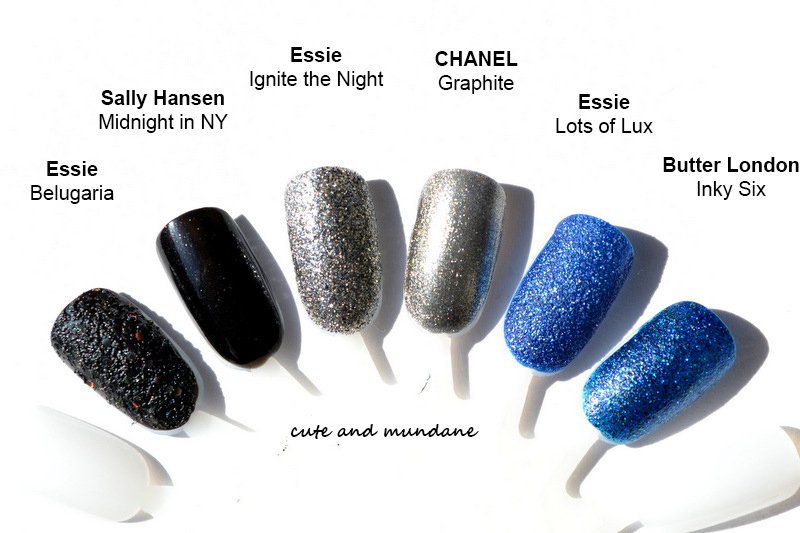 I mentioned above the similarities between Essie Ignite the Night and the iconic CHANEL Graphite. You can see that both have that wonderful charcoal with gold sheen. However the former has a bit grittier glitter, while the latter goes for a more micro-shimmer effect. Essie Lots of Lux is quite similar to Butter London Inky Six (reviewed here); it's a tad less purple and has a more matte, textured effect. The uniquely textured collection of polishes in Essie Encrusted Treasures (Holiday 2013) is a fun addition to the season of sparkle and shine. Essie Belugaria wins the award for the most unique polish I've seen in some time, though I'm most charmed by the glowing charcoal of Essie Ignite the Night! Thanks for reading! Which polish from Encrusted treasures strikes your fancy? What holiday glitters have you worn lately? What do you think of Essie Belugaria - bizarre or beautiful? P.S. 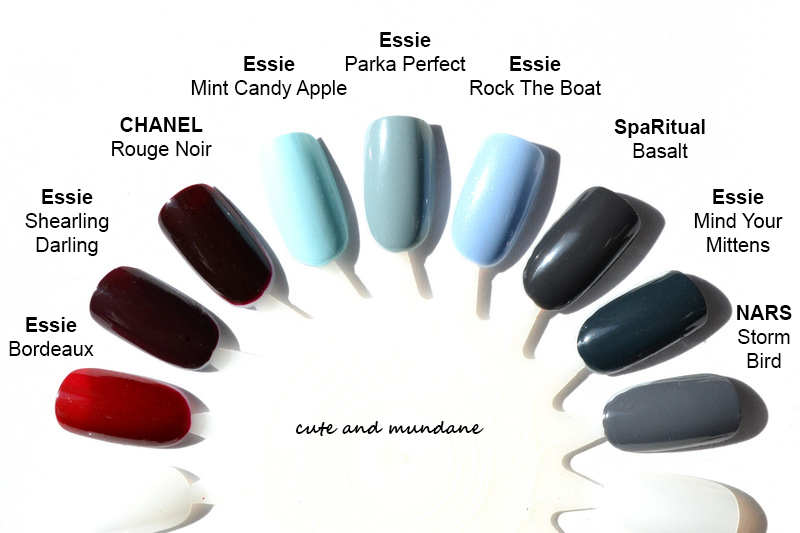 Be sure to check out my review of the Essie Shearling Darling collection (Winter 2013)! As a Chicagoan, I think it's fair to say that I've experienced my fair share of winter! But even though icy winds and seeping cold dominate the winter experience, it's the sensation of warmth that truly defines it. There's something quite wonderful about stepping out into a cold, mid-December flurry bundled in a downy parka, shearling boots, and thick, woolen mittens, scurrying down the street into the inviting, oven-toasted warmth of my neighborhood's fragrant French bakery! 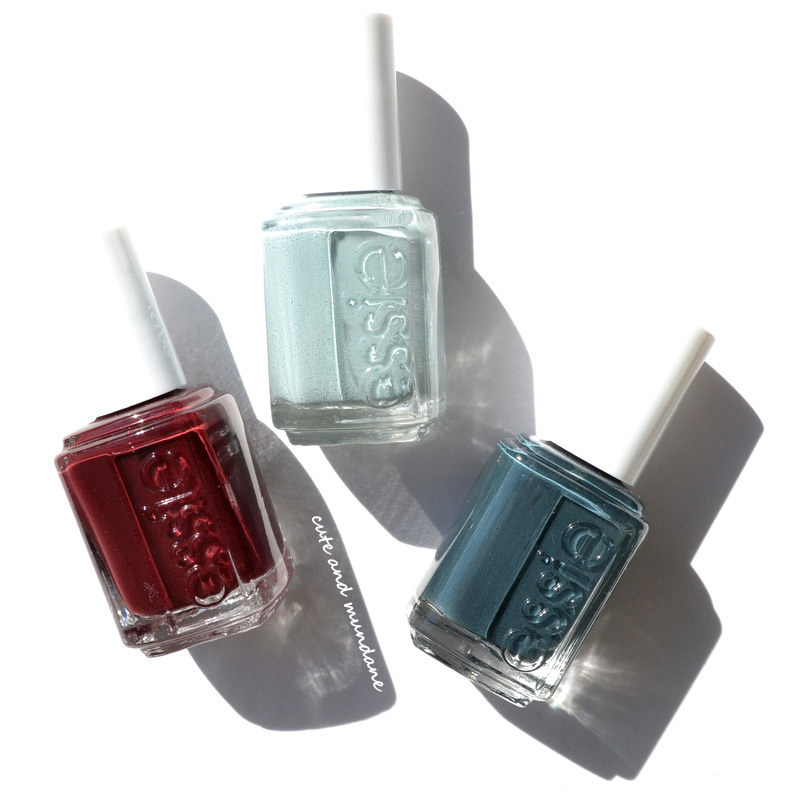 To celebrate the season, Essie has created a collection of polishes with warm, fuzzy, wintry names. Today I have the creme shades from Essie Shearling Darling (Winter 2013) to share with you, courtesy of Essie! I'm not one to resist a darling dark red like Essie Shearling Darling! 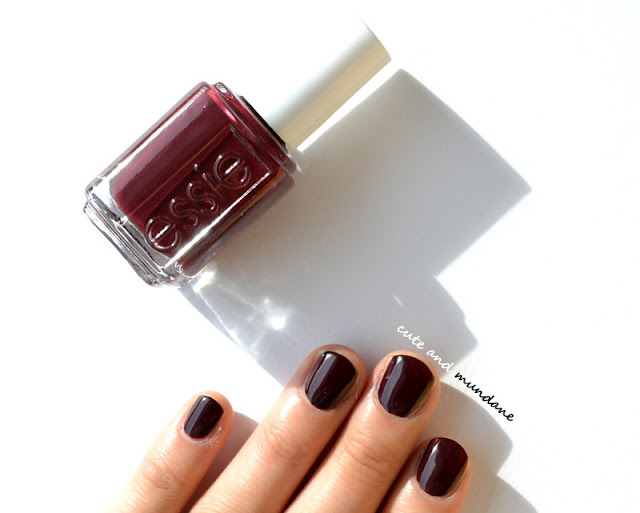 Essie Shearling Darling, the namesake shade from the collection, is a gorgeous dark burgundy red creme polish. (You know how I feel about dark reds!) Of course, this was the first shade I applied from the collection, immediately upon receiving it. Essie Parka Perfect is a dusty grey-blue with barely perceptible shimmer. I think it's a lovely representation of melting snow (or perhaps a melting snowman?). I love the subtle tinting of this glacier blue; it evokes a sense of obscure, clouded depth behind a tranquil exterior. It was slightly tricky to apply, but the color was worth it. Essie Mind Your Mittens is a dark blue spruce. The teal blue conveys the dimly reflective shadows of evergreen hills, permeated by pallid winter light. The creme nail polish applied smoothly in 1-2 coats. I've made a few comparison swatches to better show the nuances in my set of polishes from the Essie Shearling Darling collection. CHANEL Rouge Noir (reviewed here) is a dark, blackened crimson, while Shearling Darling is lighter and more brown (i.e. maroon). Essie Bordeaux, one of the oldest reds in my collection, is a much lighter shade of wine. Essie Mint Candy Apple is brighter, more candy colored, and more green than Essie Parka Perfect. Essie Rock The Boat (reviewed here) is more sky blue; you can appreciate the greenish tones in Essie Parka Perfect in the comparison. SpaRitual Basalt (reviewed here) has similar intensity, however it is more grey and less blue-green than Essie Mind Your Mittens. NARS Storm Bird (reviewed here) is lighter, again more grey, and less blue. This winter, I'm planning on delighting in my warmest winter wrappings, along with as many mocha lattes as I can get my hands on! Of course, a matching manicure à la Essie's Shearling Darling collection adds just the right touch to a warm winter ensemble. Of my three, Essie Shearling Darling steals my heart, however the glacier blue of Essie Parka Perfect is quite wonderful as well! Thanks for reading! Have you picked up any shades from Essie Shearling Darling (Winter 2013)? What Essie shades have you been loving lately? P.S. 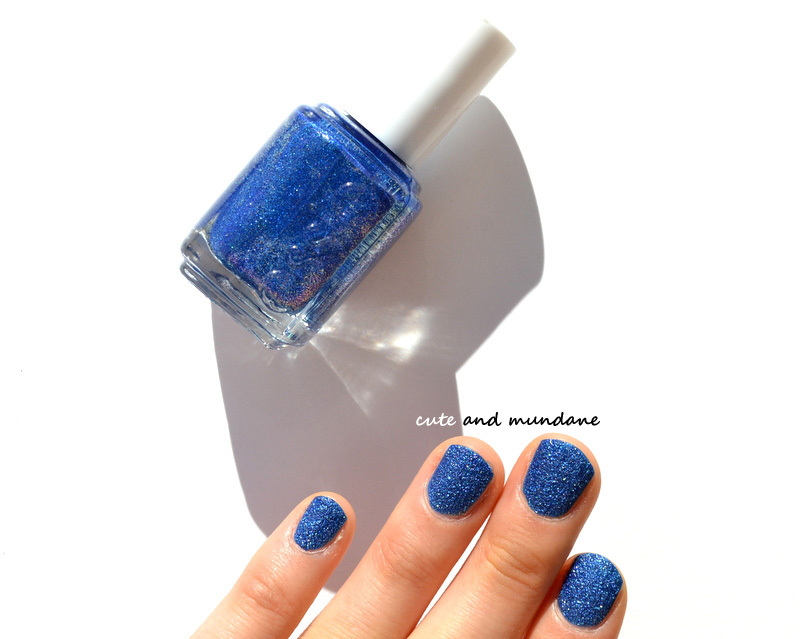 I have shades from Essie Encrusted Treasures (Holiday 2013) coming up next, so stay tuned! Hello! 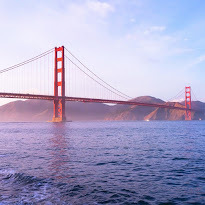 I've been having some much needed fun road-tripping across the East Coast (a.k.a. my old stomping grounds) this week! Though I've been on the move, I do have a handful of works in progress to share in the very near future : a few fabulous shades from Essie (shown above), a little LUSH, and pretty Prada perfume to boot. Be sure to check back soon! This past week, I attended a screening of Billy Wilder's Sunset Boulevard at work. This classic standard of American film noir paints a bizarre picture of the fantasy world of faded silent film star Norma Desmond, through the eyes of out-of-work screenwriter Joe Gillis. Though our purpose for watching was an exercise in formal psychoanalysis, I was reminded of how much I enjoy the genre-defining cinematographic interplay between light and shadow of 1950's film noir! When it comes to nails, I've always had a penchant for the dramatic. Building on the spirit of noir drama, there's nothing that says femme fatale quite like a dark rouge lacquer! Today I'm sharing my most recent acquisition in the genre : CHANEL Vernis in Rouge Noir, a shade I'd been eyeing for quite some time. When I saw that Rouge Noir was available as a limited edition release in Les Coleurs Culte de Chanel, I had to pounce! By now you know I'm very particular about my colors, especially dark reds. My preference leans heavily toward true blackened crimsons, as opposed to reds with burgundy, purple, orange, or cherry tones. (I suppose it's due to my perfectionist tendencies!) As you can imagine, I get pretty excited when I come across the 'right' red! 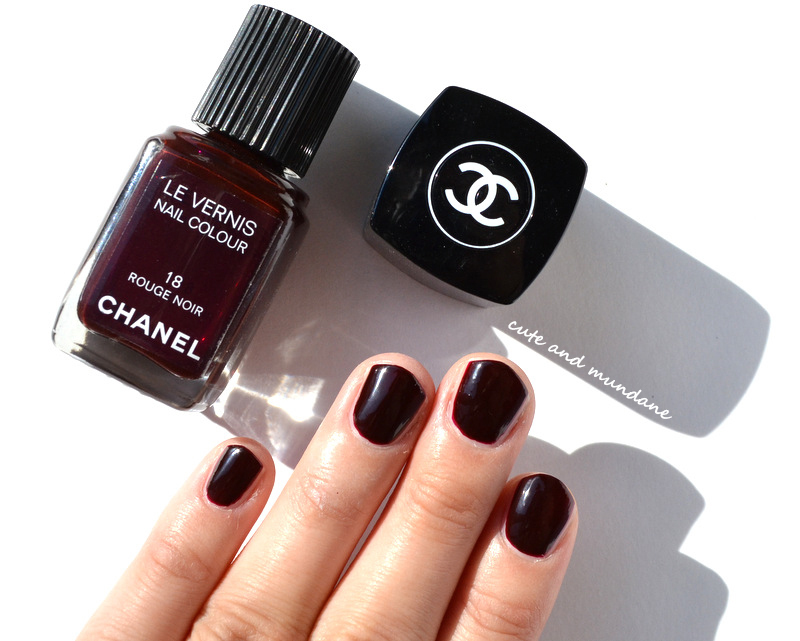 CHANEL Vernis in Rouge Noir is a dark, dark red. I find that it takes three coats to reach full opacity, as shown below. Two coats can be sufficient, though you may notice an occasional streak; the red can come across a bit lighter and brighter from the barely perceptible show-through. (This might account for some of the variability in web swatches). Three layers of CHANEL Vernis Rouge Noir are required for full intensity! 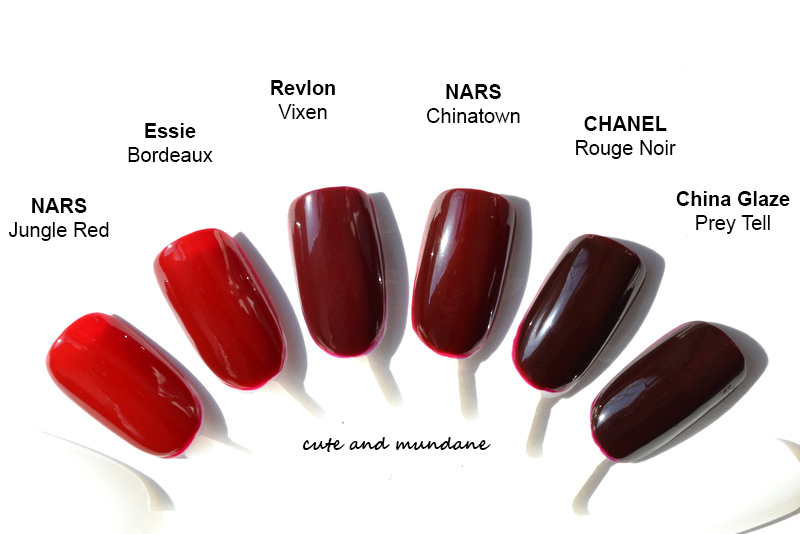 I've swatched CHANEL Vernis in Rouge Noir next to an assortment of colors in my dark red polish collection. At a glance, you can see it's one of the darkest in my collection. It's significantly darker than NARS Jungle Red and Essie Bordeaux, both of which look a bit lighter below than they do in person. Initially, I was concerned that CHANEL Rouge Noir might be too similar to my favorite shades, NARS Chinatown, and Revlon Vixen, however you can see it's still quite a bit darker than both. China Glaze Prey Tell is the closest in intensity, but leans slightly more purple than red. 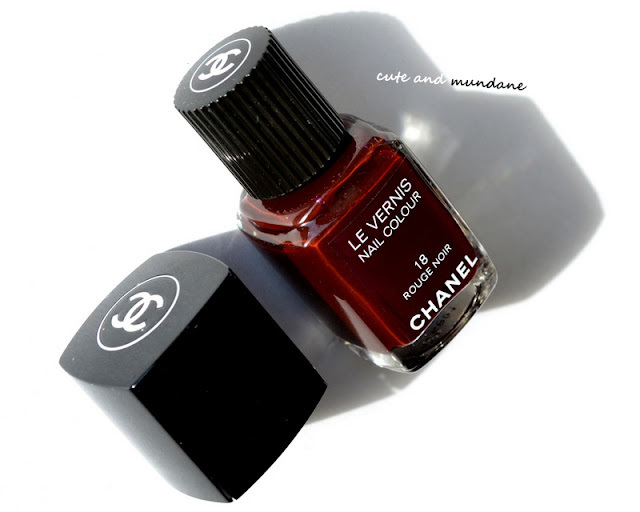 CHANEL Vernis in Rouge Noir is the perfect blackened red for channeling femme fatale at my fingertips. Though, unlike Norma Desmond in Sunset Boulevard, I'll be avoiding the postured talon look; I prefer to keep my dark nails short and chic! Thanks for reading! Do you have a bottle of CHANEL Vernis in Rouge Noir in your polish collection? What are some of your favorite dark red lacquers? What are your must have CHANEL shades? I usually don't make a habit of using up a product before snapping a photo, but I really couldn't resist Rose Jam! 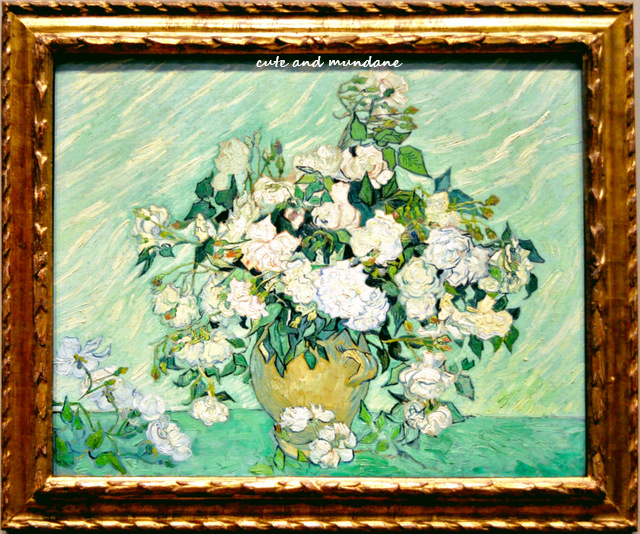 I have a 'gem of a jam' to share with you today on Cute and Mundane! Every holiday season, you can find me dabbling with LUSH's limited edition items, both on my own and courtesy of the fine folks at LUSH. Shower gels are among my favorite standalone products, as they're a practical way to perfume my everyday routine. 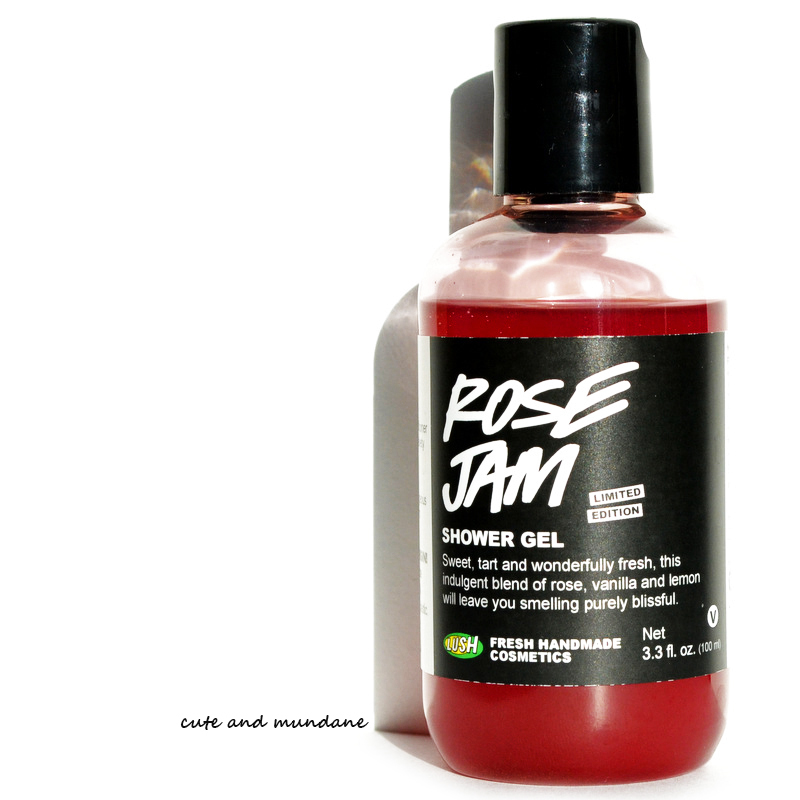 This year, my must-must-must-have item from LUSH Holiday 2013 is LUSH Rose Jam shower gel! LUSH Rose Jam shower gel was inspired by an actual traditional rose jam recipe shared by LUSH's Turkish rose supplier. The fragrance combines Sicilian lemon oil and Turkish rose absolute to create a sweet, gummy (or should I say jammy?) combination. 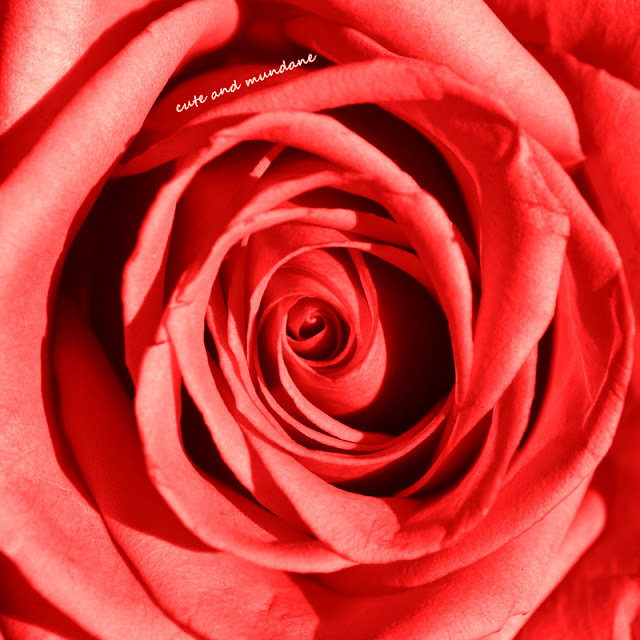 Rose lovers will enjoy the generous full-bodied dose of Rosa damascena infused within. Lemon is the perfect addition to add freshness to the otherwise stately flower. Vanilla pod infusion and goji berry juice add a 'very berry' sweetness to the mix. As someone who has tried quite a number of LUSH shower gels, I'd say LUSH Rose Jam is more moisturizing and less sudsy than most (although it will still foam up readily! ), due to the inclusion of argan oil. Thanks for reading! Have you sniffed LUSH Rose Jam (the shower gel or bubbleroon)? 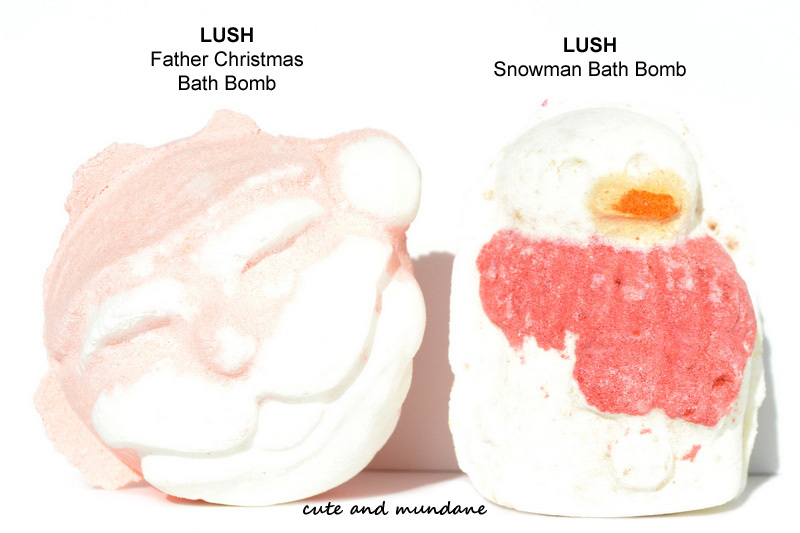 What have you been eyeing from LUSH Holiday 2013? What are your favorite LUSH shower gels? I've always felt that November heralds the twilight of the calendar year. Deep blues and majestic hues color the long shadows cast upon the Northern hemisphere, punctuated by the festive glow of tiny twinkling lights that mark the beginnings of the holiday season. These wintry chroma certainly feed my flair for vivid colors, and also (incidentally) complement my 'winter complexion! Today, for my monthly A few of my favorite things series, I''ll be sharing snapshots of the threads and maquillage that I've adorned (and adored!) this November! While most are donning perfumes laden with sugar and spice at this time of year, I've been helping myself to a seasonal slice of citrus! 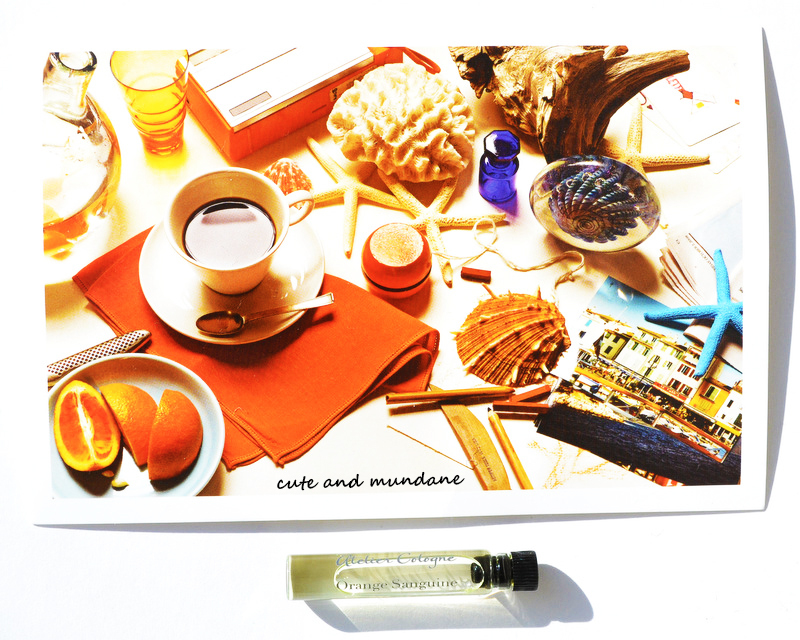 My spritz of choice has been Atelier Cologne Orange Sanguine, a blood orange concoction that's anything but sweet. It has the bitterness of an orange rind, tempered by the slightly sour clarity characteristic of real citrus fruit! Illamasqua Lover adds the perfect whisper of peachy orange to my complexion. It also happens to be a great pairing to my embroidered sweatshirt below. I have a considerable collection of Illamasqua blushers, as the formula works well for me and agrees with my skin. When it comes to complexion, I've really come to rely upon CHANEL for my incredibly sensitive skin. CHANEL Poudre Universelle in 20 Clair is my latest acquisition from the line; the sheer finishing powder adds just the right touch to any look. I've stashed away my brown pencil liners in favor of liquid blacks. There's nothing I like better than a crisp long-lasting line! The dramatic contrast is particularly flattering on those with cool winter complexions like myself. I've been all about noir nails this month! Black is an unusual lacquer shade for me, but it's a perfect complement to this season's monochrome styles. 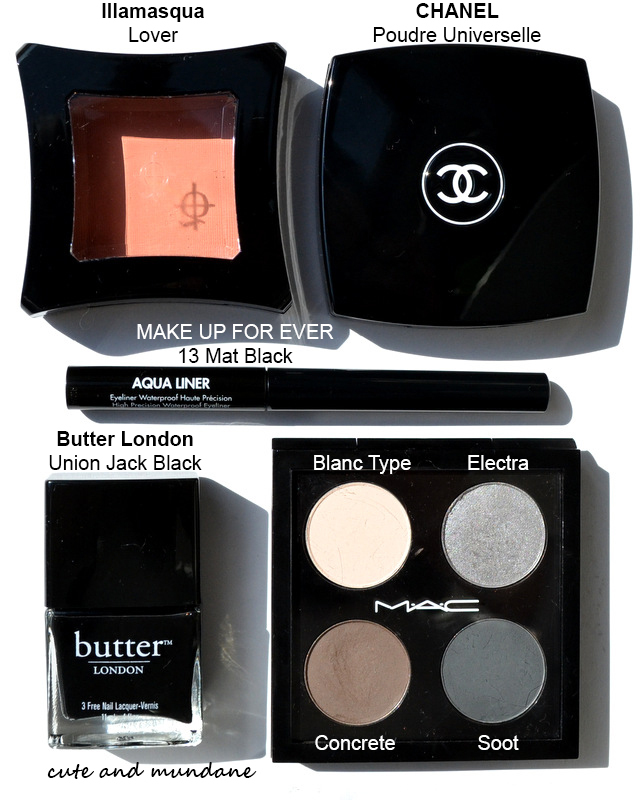 My favorite has been Butter London Union Jack Black, which applies beautifully and dries fairly quickly; it's been a great go-to for nights out. As you know, I'm a big fan of the MAC custom quad, which allows me to precisely arrange the color combinations I require. As you can see, my current custom foursome contains a set of very basic, monochromatic colors, including MAC Blanc Type, MAC Electra, MAC Concrete, and MAC Soot. MAC Blanc Type is my newest acquisition; it's the perfect cream base with pink undertones. Normally I'm not a pattern person, but it was hard to resist this gorgeous embroidered sweatshirt from J.Crew fall! 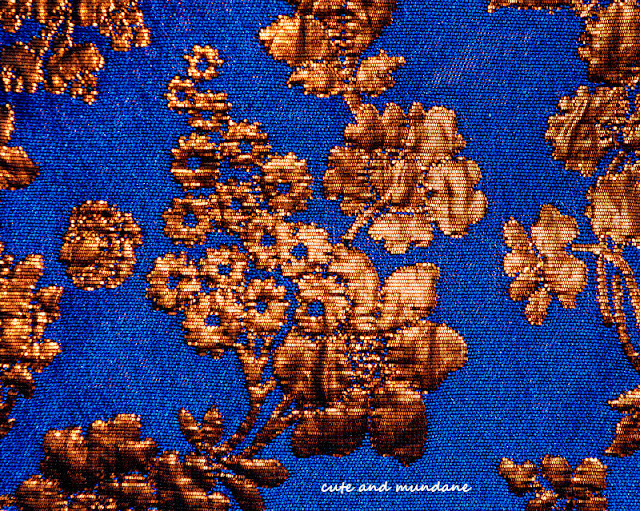 I love the Dries van Noten-esque feel of the patterning, and the defining contrast between the navy and coppery orange threads. I've been wearing this comfy-cool piece all month long. Closeup of the embroidered paneling on my J.Crew floral sweatshirt in navy. I hope you've enjoyed my favorites this month! I've really been embracing navy and noir this November, inspired by the lengthening shades of winter light. Orange punctuation makes for a natural embellishment on this twilight aesthetic, adding a hint of the warm candle-lit glow seen twinkling through frosty windows! Thanks for reading! What perfume, makeup, or threads have you been loving this November? Do we share any favorites? As winter nights grow longer, inky purples and starshine decorate the sky, adding a sense of mystique to this wonderful season. Naturally, I've been inspired by these twilight tints - and have been showcasing these shades at my fingertips! 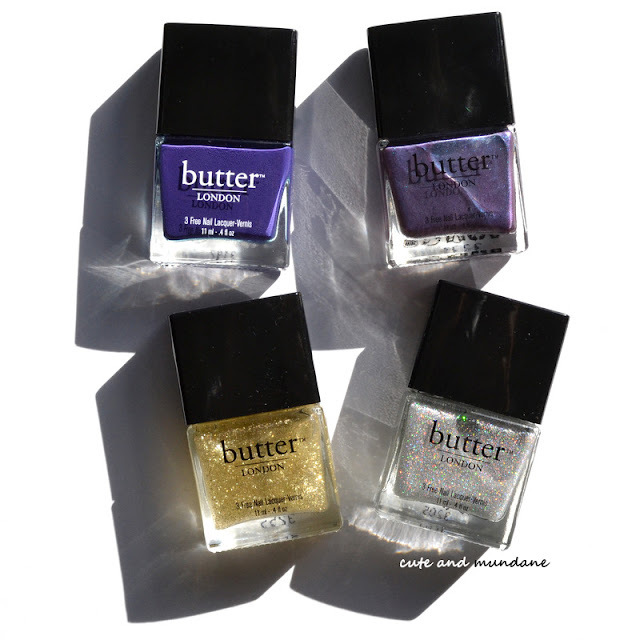 As you can imagine, I've been enjoying the Butter London Illusionists nail lacquer collection (Holiday 2013) courtesy of Butter London. This ensemble features four new night-sky-shades perfect for layering and includes Bramble, Petrol, Stardust, and Stratford Honey. 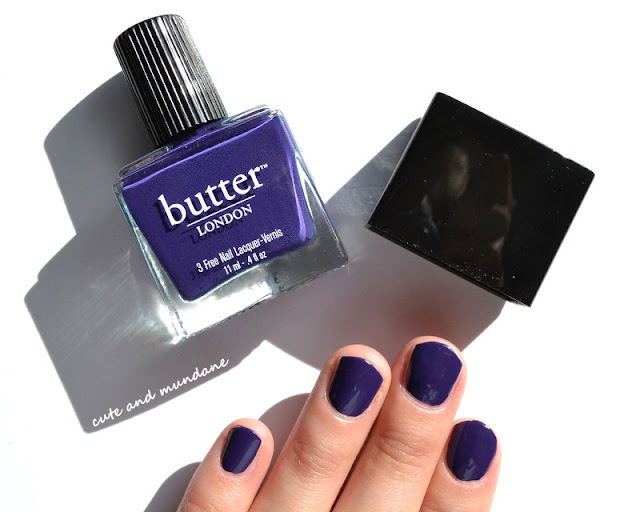 Butter London Bramble nail lacquer is a dark blue toned purple creme. You can see my comparison swatches below. 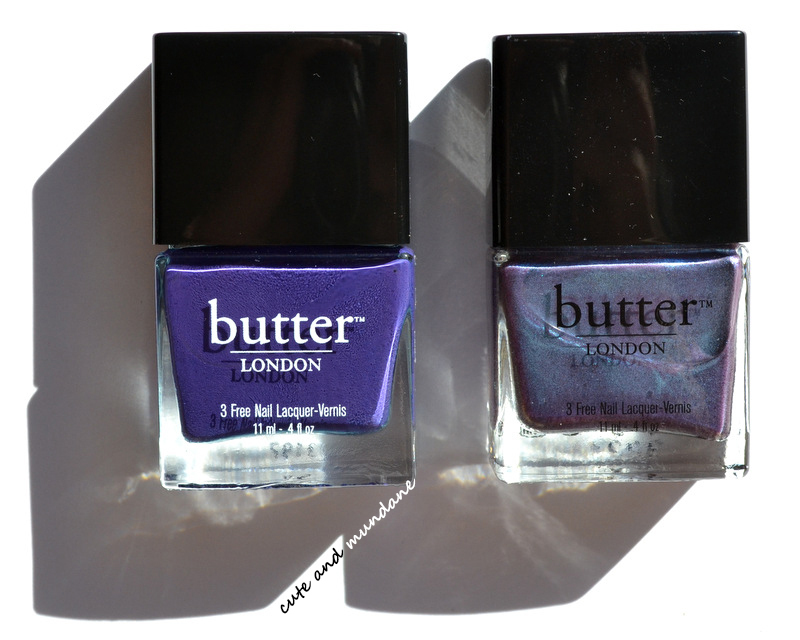 I've compared it to Butter London Pitter Patter (reviewed here), which has more red tones. Butter London Petrol overcoat is meant to be worn over other nail lacquers, however with 3-4 coats it can stand on its own (see swatch above). Petrol exudes a complex iridescence, much like an oil slick; it's a pink-purple base that reflects blue in the light. I've compared it to another iridescent polish, OPI Not Like the Movies (Katy Perry collection) to give you an idea of how exactly it reflects. I've really been loving black nails as of late, which is unusual for me. They are an appropriately mod statement for the current season and they look chic with shorter nails. Butter London Union Jack Black is a part of the brand's regular lineup and the Illusionists collection. It's a perfect background for the three new 'overcoats' (more on that below). I've swatched the three new Butter London Illusionists collection overcoats atop Butter London Union Jack Black. 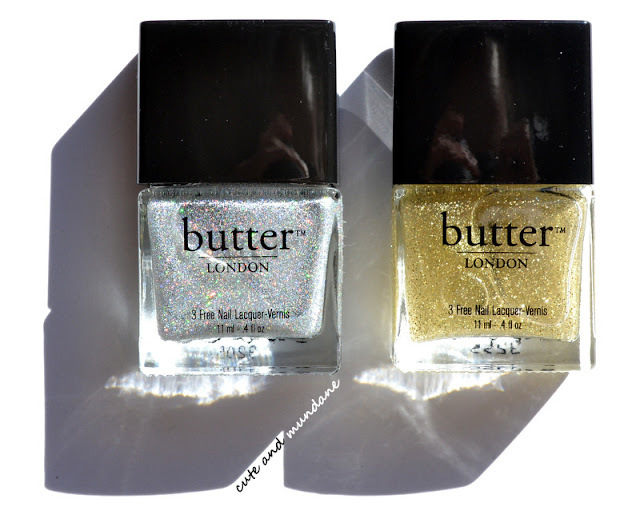 Butter London Stardust overcoat is a very dense collection of silver holo microglitter. With a few coats, it could probably stand on its own. The finish isn't particularly glossy. If you want more shine, it would be worth adding a clear topcoat. Butter London Stratford Honey overcoat is a significantly less dense collection of small gold glitter particles. Even with several coats, you'll never achieve full opacity with glitter. As you can appreciate from the bottle above, the gold is a lighter yellow (as opposed to a 24K) type of gold. The finish of this topcoat is very glossy. I showed Butter London Petrol overcoat alone above, and atop black polish below. You can see that the pink-purple base is less visible. The special bluish sheen is the final effect. 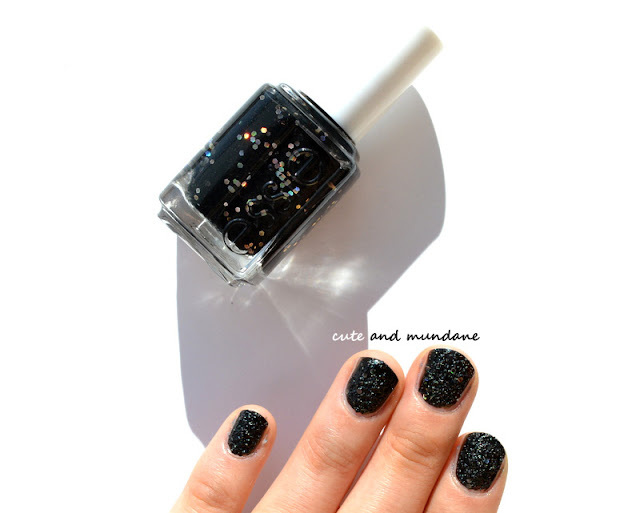 With layers of Butter London Illusionists nail lacquer collection (Holiday 2013), I can keep shades of the night sky at my fingertips! I'm most fond of the new creme color, Bramble. (You know I love my cremes). That said, I love the touch of starshine that Butter London Stratford Honey adds to my tips as well! Thanks for reading! 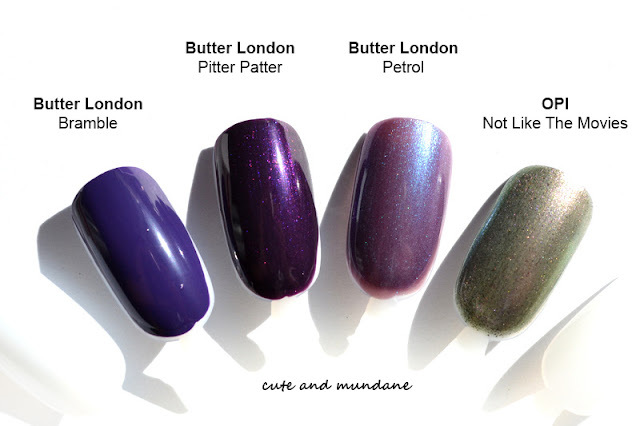 Which shades from the Butter London Illusionist collection strike your fancy? What hues have you been wearing this holiday season? There's something magical about pale pink; the airy kiss of color offers up the impression of blooming rosebuds and their delicate petals. I must admit I'm quite partial to the hue, as I wore pale pink lipstick to my wedding. It's delicate, feminine, and allows my natural features to shine. As you might imagine, I'm always on the lookout for new shades within this rosy slice of the color wheel. When I saw CHANEL Rouge Allure Lip Color in Radieuse in the CHANEL Nuit Infinie collection (Holiday 2013), I knew it would find its way into my collection! When it comes to lighter lip colors, finding the right shade can take a bit of finesse. Slight variations in undertone and transparency can make a world of difference! My skin currently runs on the cooler end of the East Asian spectrum, so I find that neutral to slightly cool colors are most flattering on me. CHANEL Rouge Allure Lip Color in Radieuse is quite light on me and tones down my lips considerably! The finish is satin. The formula is relatively comfortable; it's not quite creamy, but not too drying either. I find that Radieuse's undertones work well with my 'winter' complexion (dark hair, light skin, cool tones). It may be a challenging shade, however, for those with a warmer complexion! 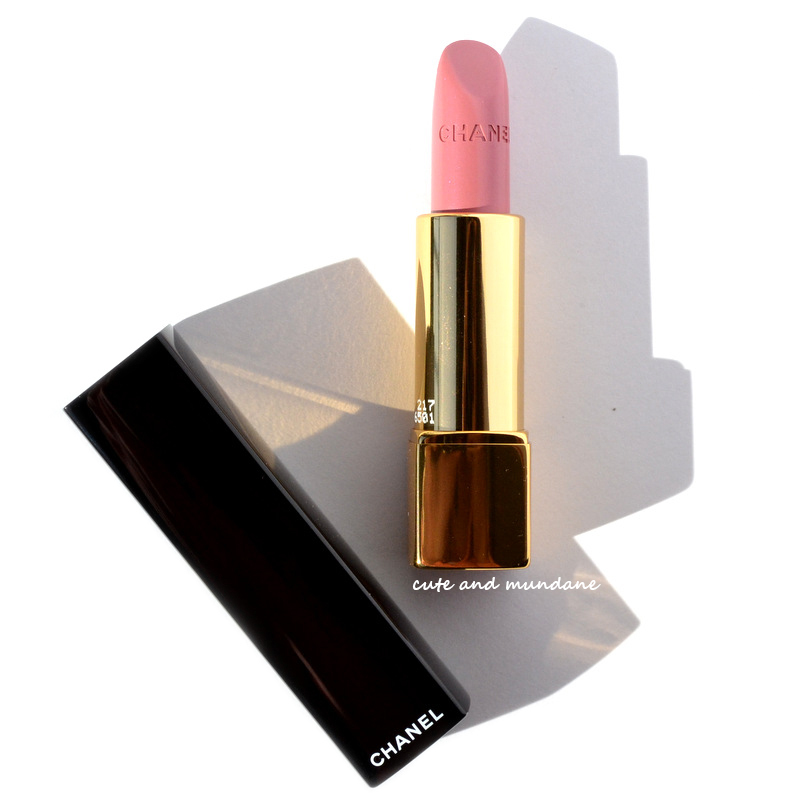 CHANEL Rouge Allure Lip Color in Radieuse is a pale to light rosy pink with neutral to cool undertones. 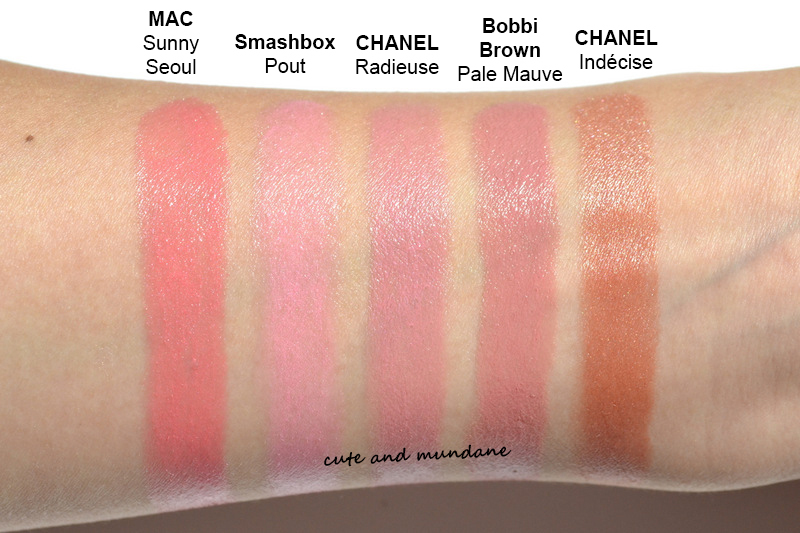 Pale pinks can be nuanced, so I've drawn up comparison swatches below. MAC Sunny Seoul lipstick (reviewed here) is considerably brighter and more saturated in color. Smashbox Be Legendary Lipstick in Pout is a cool bubblegum pink; you can see that Chanel Radieuse is more neutral and natural. 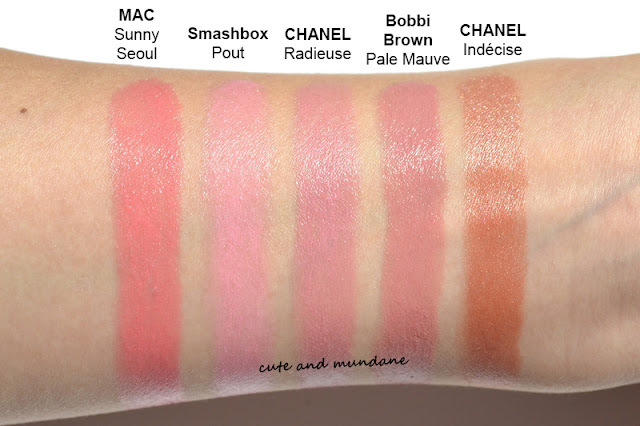 Bobbi Brown Pale Mauve is quite similar when swatched, but a bit darker when worn. It's also the slightest bit warmer and more mauve. I've also swatched CHANEL Rouge Allure in Indécise (reviewed here), another light shade from the Chanel Nuit Infinie collection. You can see the stark contrast between these two shades. Chanel Indécise is so much warmer! 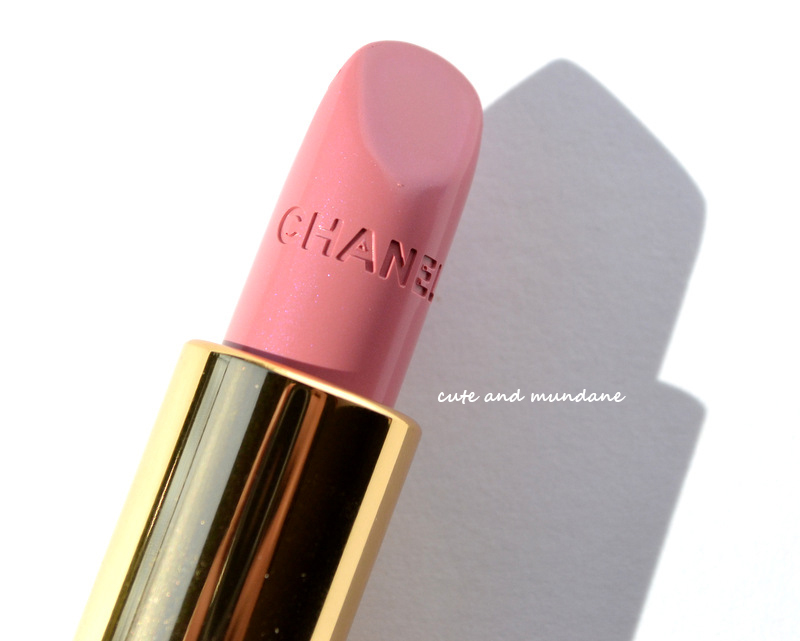 I love the pale-petaled pink of CHANEL Rouge Allure Lip Color in Radieuse! This lovely light color looks oh-so-chic when paired with eyes lined with the deep black of the winter sky. It's a favorite-worthy shade that should carry me well through the winter months! Thanks for reading! Have you tried CHANEL Radieuse or anything else from the CHANEL Nuit Infinie collection? 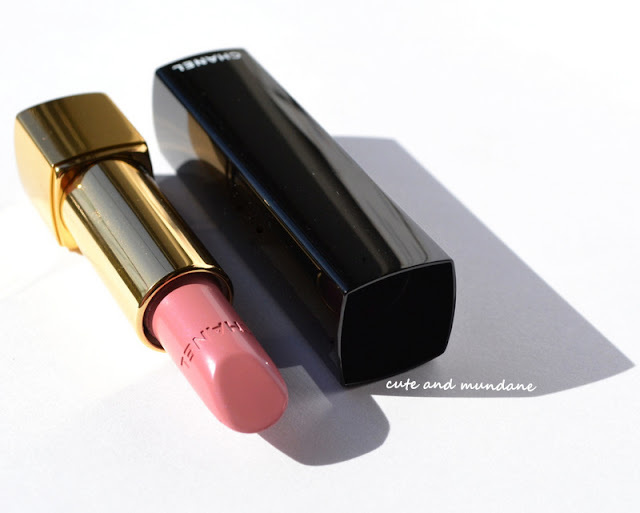 What are your favorite pale pink lipsticks? What CHANEL shades should I try next? P.S. Be sure to check out my review of CHANEL Rouge Allure in Indécise, also from the Chanel Holiday 2013 collection! Happy Friday! I love the way bookshelves become populated with personal artifacts from both past and present, evolving into squared-off microcosms of our lives! 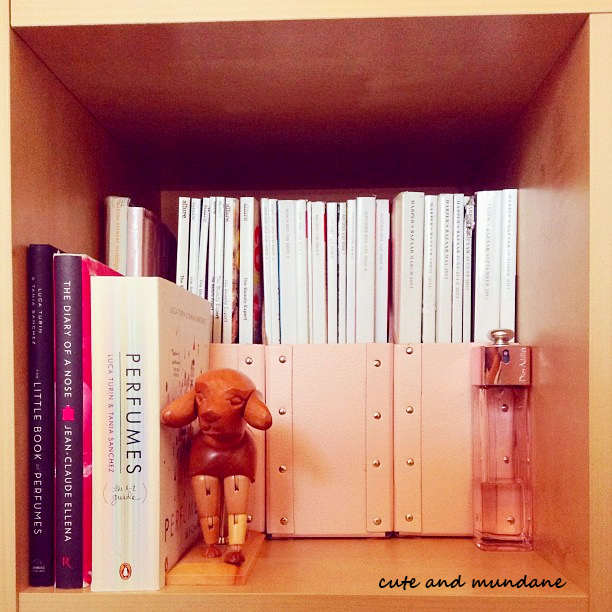 Recently I shared a snapshot of one cube in my bookshelf on Cute and Mundane's Instagram, the aftermath of a mini organization session. I loved the homey effect of the arrangement, and thought it would be fun to share a little personal history by cataloging five of my personal effects seen here! I seem to have accumulated quite a number of subscriptions this year! (They were, in fact the impetus for this organization session --- having been previously scattered across every nook and cranny of my home). As I've mentioned before, I adore Harper's Bazaar, which is by far my favorite read. 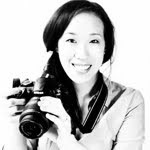 My current beauty and fashion glossies also include Marie Claire, Allure, and Elle. I'm of the opinion that office accessories (or any accessories, really) are always better in pink! I picked up these pink IKEA files years ago when I first moved to Chicago. Dior Addict 2 was my signature scent when I met Mr. Lovey and it's the only perfume I've bought more than one bottle of. Sadly, the optimistic pink perfume is no longer in production, and the juice left in my bottle has lost its pep. I keep the bottle as a memento of a longtime love! Wooden marionettes are a staple for those who love to sketch! I especially love this artist's version of man's best friend, as I've been a dog person for as long as I remember. Plus, it has floppy ears like both Baby Bird and Robin! I've collected quite a few perfume reads over the past year. (You can find a list in my Perfume Book post here). My favorite texts have been by perfumer and author Jean-Claude Ellena, exclusive perfumer for Hermès. I suppose it's natural that I enjoy his prose almost as much as I enjoy his olfactory compositions! The titles I own include Perfume : The Alchemy of Scent and The Diary of a Nose. Thanks for reading! What personal artifacts do you keep on your bookshelf? 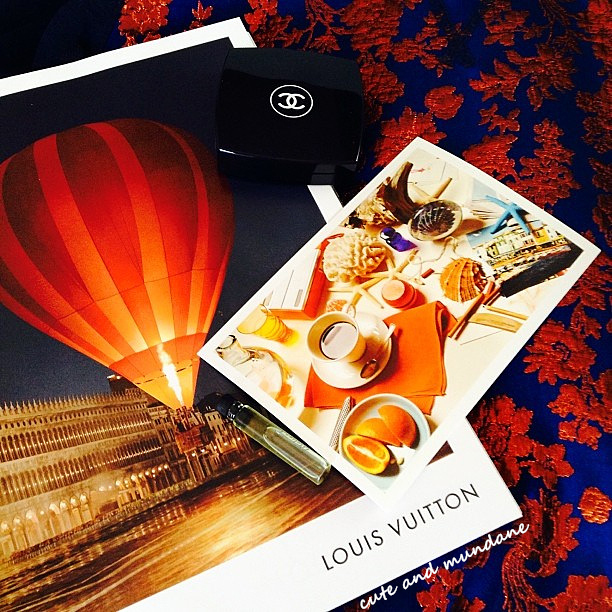 What magazines, books, or perfumes have you been loving lately? Every holiday season, festive delights and colorful cakes line the frosty windows of LUSH boutiques nationwide! Crafted from essential oils, fruits, and vegetables, LUSH soaps are among the most inspired of their original creations. Today I have slices of LUSH Mr. Punch soap, LUSH Noriko soap, and LUSH Orange soap from the LUSH Holiday 2013 collection to share with you today, courtesy of the folks at LUSH! I was delighted to see the return of LUSH Mr. Punch soap, which debuted this time last year. Mr. Punch has a bright fruity blackcurrant scent, mixed in with an undercurrent of gin. Contained within the soap are blackcurrant absolute, fresh lime oil, juniper berries, and a splash of gin. The soap cakes are even crafted to look like fruit punch! 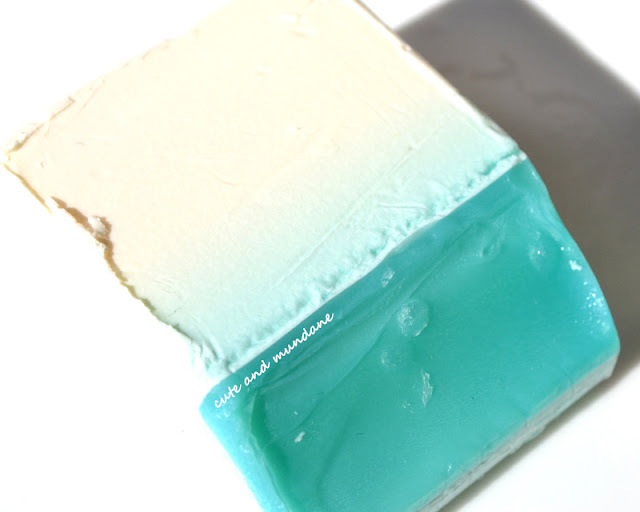 LUSH Noriko soap is as creamy as it looks! 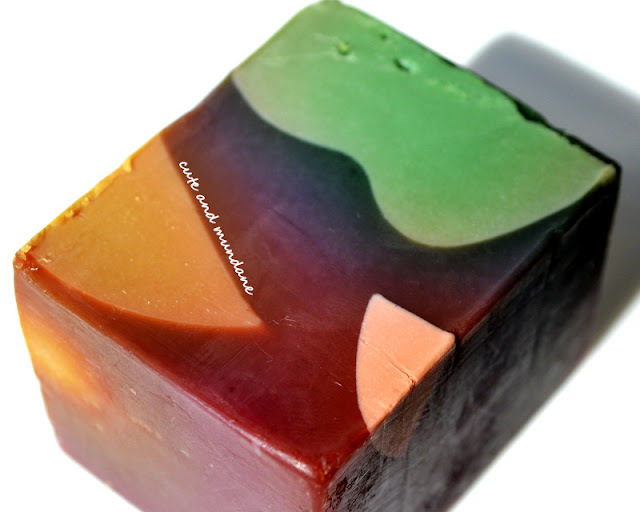 LUSH Noriko soap is a new addition with Asian flair! This delicate floral soap boasts ingredients like sake, rice decoction, and tofu for a creamy cleanse. The soap smells of rose, ylang ylang, lavender, and orange oil. LUSH Orange soap is sure to add a sunny squeeze to dark winter days. 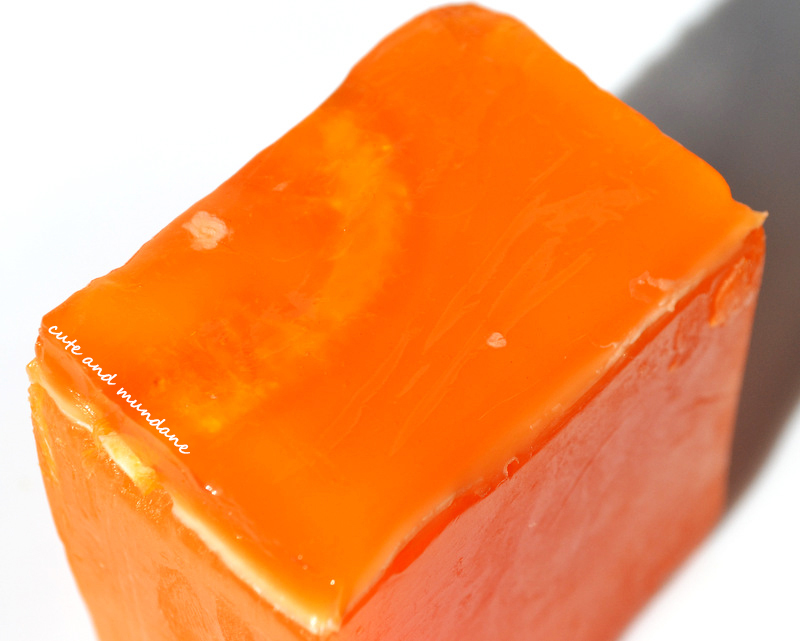 This new addition to the Holiday 2013 lineup contains fresh OJ to cleanse, and Brazilian orange oil to tone; orange slices embedded in a squishy gel can be seen contained within the translucent block! So many of layers of orange in LUSH Orange soap! 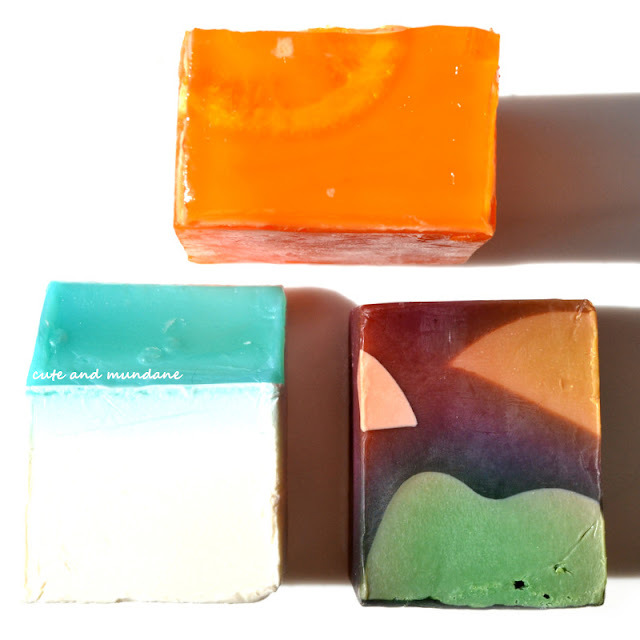 LUSH Mr. Punch soap, LUSH Noriko soap, and LUSH Orange soap (3.5 oz. for $6.95) each provide a little slice of paradise during these cold winter nights! I'm loving all three, but if I had to choose, LUSH Mr. Punch would have to be my favorite. There's something about the berries and gin combination that's delectably unique! Thanks for reading! Have you browsed LUSH Holiday 2013? What are your favorite LUSH soaps? Which holiday LUSH soap would you choose?